Do you crave the freedom to do what you want, when you want to? We all want to taste the joy of living a fully rich life with experiences that connect us and help others. 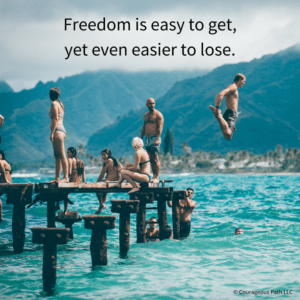 Most people don’t realize that Freedom is easy to get yet even easier to lose. A recent article described how the first African from South Africa climbed Mount Everest. Truly incredible story how a very agile man accidentally met a British gentleman who knew about an expedition to Mount Everest. He opened his eyes to an incredible opportunity that taught him extreme alpine mountaineering skills and took him high above the clouds to a new destination he couldn’t even dream about. This opportunity gave him incredible freedom to now live a life he didn’t even know was possible. Where do you squash the freedom you’ve been given? Do you spend energy on activities that drain you? Do you waste time on distractions that don’t serve you, your life’s mission, or your relationships? Do you schedule what’s important to you? Are you ultra-focused throughout the day? In the long run, freedom is all about discipline. Is your discipline razor sharp? If not, what can you do to improve this? Do you spend more time on distractions than your dreams? 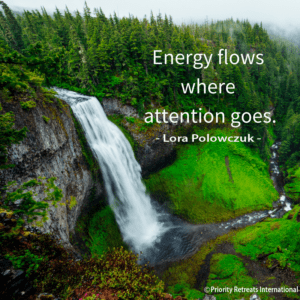 The famous saying, “Energy flows where attention goes.” is spot on. Gillian’s intense job led her to frequently check her phone to break up the intensity. This gave her a break from the daily grind. Every time Gillian saw a new social media post or text from a friend she got excited. It made her feel good and she received an extra punch to keep going on with her day. The extra punch is actually the neurochemical, dopamine, that is associated with reward, yet also involved in addiction. Over time, Gillian started spending more time on her phone than doing the required work. Her work performance suffered and, her relationships deteriorated as social media provided a false sense of connection. Sound familiar? Gillian realized her dreams kept getting farther and farther away. It takes an of average of 25 minutes to get back on task after a distraction. How much time does this cost you during the day? How much further are your dreams because of distractions? How do you break this cycle? Here are some valuable tips. 1) Turn off all notifications on your phone. 2) Put your phone where you can’t see it or access it within arm’s reach. 3) Schedule time for valuable tasks and don’t let any distractions pop up. Ready to gain more time in your day? These simple tips can save hours in your week and give you the time you desperately crave for what’s really important to you. Lisa sat on the cold, damp bathroom floor crying. What’s happening? I’m exhausted, drained, and overwhelmed by everything. As the tears dropped off her cheeks, she stood up slowly and looked at herself in the mirror. She could barely look. Lisa took a deep breath and said, This has to change. She took a cleansing shower. With the drops of water pouring over her, she closed her eyes and imagined how she truly wanted each aspect of her life. Lisa got out feeling refreshed and immediately put her mind and body to work. What was the biggest obstacle that she currently faced? Lisa realized it was the pain in her back that took away her energy and caused her inability to focus. While she had to visit a number of practitioners to identify the root cause, after nine months she received the proper care and treatment. One year later, Lisa ran a half-marathon completely pain free. She had so much energy that she signed up for a full marathon for later in the year. On top of that, she served as a role model at work and received a promotion. When you look at your life garden, are you nurturing the weeds or the flowers? Too many of us go through the motions of our day with no intention. 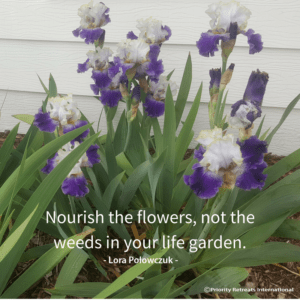 It’s time to nourish the flowers not the weeds in our life garden. Planting a seed of opportunity doesn’t mean that it will blossom overnight. This picture is Iris plants that were planted 2 years ago. These plants have been hit by several hail storms and never bloomed until now. If you are intentional and take action, what will blossom in your life 6 months to a year from now? Philip worked hard to support his family and hit his next career level as Senior Director. He thought, if I just get this promotion, all will be good. Philip started working more hours and would come home depleted and set the mail on a table along with all the other papers. The long hours took a toll and Philip slowly started gaining weight. He bought some new clothes that fit, thinking this is just a temporary set-back. While Philip desperately wanted time to connect with his friends and family, work always took the higher priority. This lack of connection could be noticed in his shallow breath, racing heart, and heartache from wanting meaningful relationships. The doctor advised Philip to start taking heart medication to lower his cholesterol. This was a wake-up call for Philip. Philip came home and said enough is enough. It’s time to make some drastic changes. He cleaned up the never-ending stacks of papers all over the house, recycling and shredding. Philip looked at the clothes spilling out of his closet, haphazardly falling off hangers and in piles. He sorted through everything he hadn’t worn for a year and donated it. Philip announced to his family they would take a short getaway vacation to get back in touch with each other. Philip sat down and realized he was going through the motions. He let this toxicity build up over time. It didn’t happen overnight. Where is toxicity in your life? Do you have relationships that are no longer mutually beneficial? Are your home, office, closets in need of decluttering and organization? Does your mind lead you down the road of negative thoughts? What bad habits (e.g., eating ice cream at 10 pm) interfere with your best self? 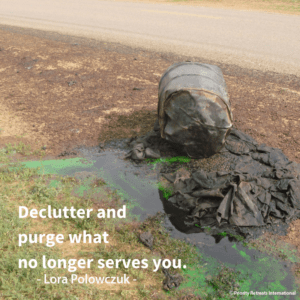 Take this spring time to declutter and purge what no longer serves you. Create open space for what you truly want to come in. Wishing you an abundant, prosperous, and joyful week!